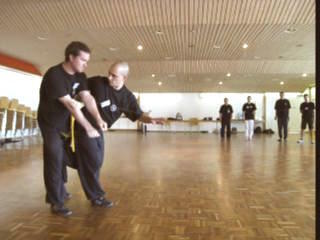 Do you know the combat application of this seemingly decorative sword pattern called "Dark Phoenix Spreads Wings"? 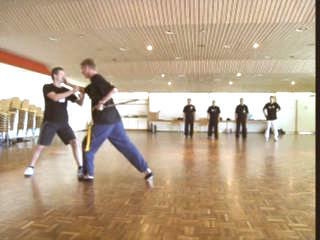 Some of the sword patterns are so sophisticated that their combat applications are not obvious, and they look like decorative patterns merely for show. Some examples are "Dark Phoenix Spreads Wings", "Carry Moon in Bosom" and "Green Dragon Washes Claws". 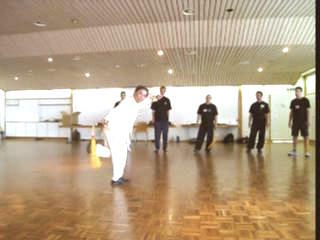 Grandmaster Wong asks the course participants to work out the combat applications of these sophisticated patterns. You may be surprised at some of the results. 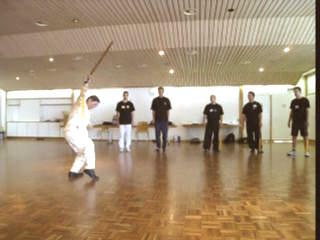 Combat Applications of Sophisticated Patterns of the Traveling Dragon Sword from Wong Kiew Kit on Vimeo.